Do you sometimes get the urge to chuck your job and take-off on your own or for that matter are already on your own and wonder if you made a mistake and should probably go back to a secure job? Do you know what’s your ‘E-Type’. Are you an employee-type or an Entrepreneur-Type. How you travel tells a lot about whether you are an employee or an entrepreneur type of person. Almost adults work. Most do it to earn a living, some lucky ones do it to stay occupied. One can work for someone else or for oneself i.e. 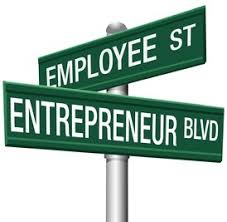 be an employee or become an entrepreneur. You may already be one or the other but do you really know which one you ought to be? Let’s say you need to travel to some place and assume that you are going to do this the old-fashioned way by taking a train. It’s been a long time since I took one so I am going to probably go back in time to my memories of train journeys undertaken which some younger readers, more accustomed to air travel, may find hard to relate. How you undertake this travel tells a lot about your ‘E-Type’. ‘Employee-Type’ people are more destination focussed. To them, the purpose of any trip is to reach the planned destination. It starts with the train or route they pick. It is most likely to be the one which is the shortest one and least likely to have delays. They find out how long the journey will take and figure how many meals they will need to provide for. They are more likely to carry food if they figure that the on-board catering options are not so great. They will also take along a book or a game because to them the journey is a lot of time that must be passed till the destination is reached. Once the journey starts, they keep checking with the train-staff if the train is on-time and will reach the destination on time. When they figure it isn’t they get anxious and if the delay is longer they tend to fret. They are unlikely to get-off the train as its stops at en-route stations just to explore and when they do, it is for a specific purpose and before they do so, they will ascertain the halt times. Once they get-off they will purposefully head to do what they need to do. They will not be taking any chances that may cause them to miss their train not only because they will not reach the destination as planned but also because it would seem downright stupid for them to have missed their train. Well before their destination arrives, they would have packed-up and would be ready to get-off. If they are being met they would talk about how much time they expect to reach in and where to meet. Any last minute delays will usually be cause for anxiety. The ‘Entrepreneur-Types’ on the other hand, are also headed to their destinations but look forward to the journey differently, They will probably look at the route and train options and pick one that they haven’t been on before or one with an interesting place or a scenic area on the route. Even if not very gregarious, they will be curious about fellow passengers and will probably be more daring with experimenting with locally available food and drink options. They are probably going to get down on strange stations where the train stops and just stroll around to see what goes on on the platform. When they get-off to wander about, they do not intend to miss their train but if they do they are less likely make a huge fuss and will probably consider it a good story to tell later. If, as often happens on long Indian train journeys, the train halts, they will be more interested in what happened rather than how much of a delay it would cause. They will probably get down and go to see for themselves what the problem is. As the train approaches its destination they will be looking out at the sights of the destination town. They might even have a tinge of sadness at the end of the journey. To be fair, one is not better than the other, they are just different. A focus on accomplishing an assigned task is what makes an employee successful just as the ability to be flexible and pivot to change the destination is an essential for a successful entrepreneur. Eliminating ambiguity before starting a job comes naturally to an employee while an entrepreneur will often start without having all the answers in place believing that improvisions and workarounds will be found as obstacles present themselves. As an entrepreneur myself, let me end by saying that this does not mean that entrepreneurs are not keen on reaching destinations or like to keep wandering-off extending journeys. They are as focussed on the destination but probably less stressed by delays on the way. They thrive on acquiring new skills and solving problems as they present themselves but they also have a very high need to achieve and be successful. An Employee-Type person may not head to a destination if the journey is fraught with risk but an entrepreneur typically sets eyes on a destination and then takes the journey with its risks and as it unfolds. More in this category: « Can Laws Bring About Good Change? Can Laws Bring About Good Change?